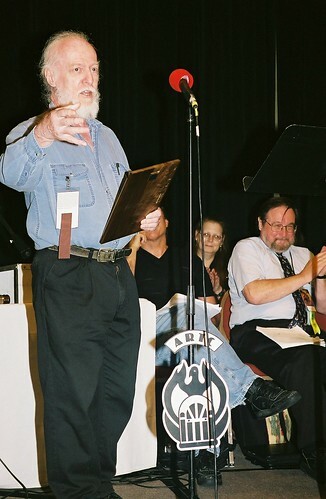 ARTC was saddened to learn recently of the passing of actor Richard Hatch. 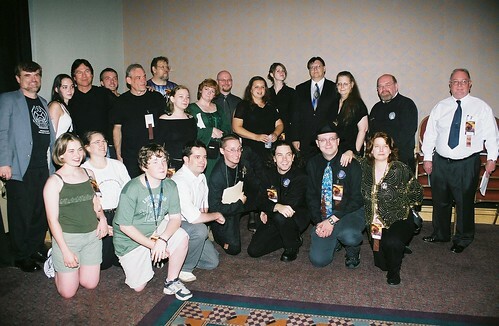 Richard performed with us in 2005 at Dragon Con in Brad Linaweaver‘s adaptation of the A. E. van Vogt story “The Weapons Shop” and had agreed to appear in the extended studio version of The Weapon Shops of Isher. He was best known for his work on Battlestar Galactica (both the original in the late 1970s and the reboot in 2004), but he also appeared in a number of other movies and television shows, including the web series written and produced by Brad Linaweaver, Silicon Assassin. He will be deeply missed by all at ARTC. A few extra notes for this episode. We have big changes in store for this podcast. First, we have increased the sampling rate for this episode and for all future episodes. When we started this podcast 10 years ago we purposely made the decision to encode each episode a lot lower than we needed to because the ultimate goal was to help people understand what audio drama was. We weren’t exactly the only game in town, but we were one of only a few audio drama companies that we knew about and what we wanted to do was draw attention to the art form and also let people know about our titles for sale. What better way than to have free samples? We also had years of live performances sitting around that didn’t meet our standards for sale, but were still something we were extremely proud of and didn’t want to keep to ourselves. Today the landscape has changed. There are dozens if not hundreds of audio drama podcasts out there. Anthologies and series, ongoing and one-offs, and at least one notable podcast about how to do audio drama podcasts. After ten years, it’s time for us to get with the times. So, with all of that said, this episode, number 167 will be the last installment of what we have been so creatively calling “ARTC’s Podcast”. Next month we’re relaunching as the Centauri Express. What’s going to be different? Lots. For one thing, we’re joining the club and will begin airing studio-produced episodes of some of the various serials we’ve written over the years, starting with our 13-part expanded story of Dash Cardigan. We’re also working on a new show intro and will be including additional segments from time to time that will feature panel discussions, interviews, and really whatever else you’d like to hear, so be sure to let us know at podcast@artc.org. Plus there’s that improved audio quality we were just discussing. What’s going to be the same? How you get us. We’re sticking with the same publication platform and RSS feed, so you shouldn’t notice much difference except in the format of the content. Also the same, unfortunately, will be the publication schedule. I had hoped to be able to bring this to you every two weeks, but we’re still getting our studio legs under us, as it were. We’ve been performing live for so long that we’ve gotten pretty good at it, if we do say so ourselves, but adding studio work in there to go with those live shows is a bit of a learning curve. Plus, we want to be able to have a consistent schedule without any gaps in publication. We’re still shooting for that every two week mark, but we want to get there in a way that is sustainable. For those of you who were enjoying the live performances, fear not. We’ll still be bringing those to you by way of Patreon, which you’ve heard me talk about for the last few episodes. All patrons at any level will be able to hear these updates, which will become free bonus content for those folks like Caran, Matthew, Kerry, Christa, John, Donald, Jason, Chelsea, Brad, Sterling, Ben, Richard, Shael, Juliana, and Sketch. The regular episodes of the Centauri Express will continue to be free, but we’d truly appreciate your support. And the last thing I’d like to ask of you before we get into this month’s episode is for you to let us know what you’ve been doing while listening to ARTC’s Podcast. Do you listen while you drive? Just sit quietly? Catch Pokemon? Do you listen by yourself or make it a group activity? Let us know at podcast@artc.org or head over to the main website at artc.org and use the Speak Pipe to leave us a voicemail that we can feature in later shows. And now for this month’s episode, which is kind of a transition episode, as this piece was produced here at ARTC Studio and is the first in a new imprint for us. Our other imprints include things like Science Fiction by Gaslight, which features adaptations of classic horror and science fiction, Into the Labyrinth, featuring original dark fantasy, and Adventures in Sound, which features original work that doesn’t really fit into any specific category. And to that lineup we are adding The Sound of Liberty, a collection of classic science fiction adaptations and some original work that highlights the principles in the American Bill of Rights. The first installment in The Sound of Liberty is this month’s audio drama offering, The Proper Thing to Do by Brad Linaweaver and William Alan Ritch, adapted for audio and directed by William Alan Ritch, produced by David Benedict. This being our 30th anniversary, we thought we’d dip back into the past and recap some of our previous performances, triumphs and tragedies, in a series of posts. And don’t forget our Chronology! It’s not as detailed, but it really shows the growth of ARTC over the years. You can see all of the photos in their full size on our Flickr album! Continuing our Dragon Con theme, we now present The Weapons Shop by A. E. van Vogt. 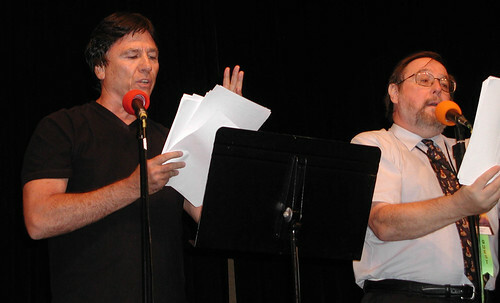 This was a great year for ARTC as we got to perform alongside Battlestar Galactica star Richard Hatch and we also announced a new imprint that will hopefully see its first title released next year, The Sound of Liberty! 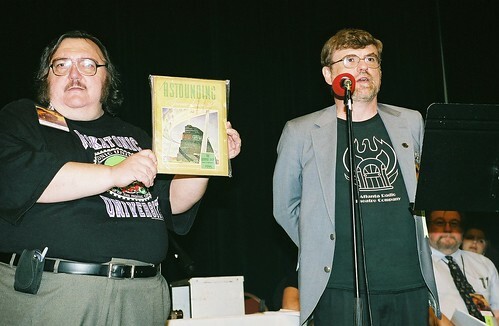 In 2005 ARTC created the Sound of Liberty project, a unique initiative to identify and adapt works of classic science fiction that put a focus on freedom and liberty. In the intervening time we’ve been busy finding suitable titles and negotiating with the authors. We hope to have the first title on this exciting new category for sale by next year, but the first title to be performed was The Weapons Shop by A. E. van Vogt. We were pleased to have been granted the rights for this performance by his widow, Lydia van Vogt. We’re really looking forward to diving into some of these amazing stories! A great performance with a stellar cast! This one’s headed for ARTC Studio very soon! We also got to honor one of our longtime writers, Gerald W. Page. You can hear his work in our catalog on The Assassins and The Happy Man! Thanks for all the great stories, Gerry!